Thousands of people pack the streets of downtown Barcelona in support of independence from Spain. BARCELONA, Spain — Hundreds of thousands of people backing Catalonia’s bid to secede from Spain packed the streets in downtown Barcelona on Saturday to demand the release of jailed separatist leaders. 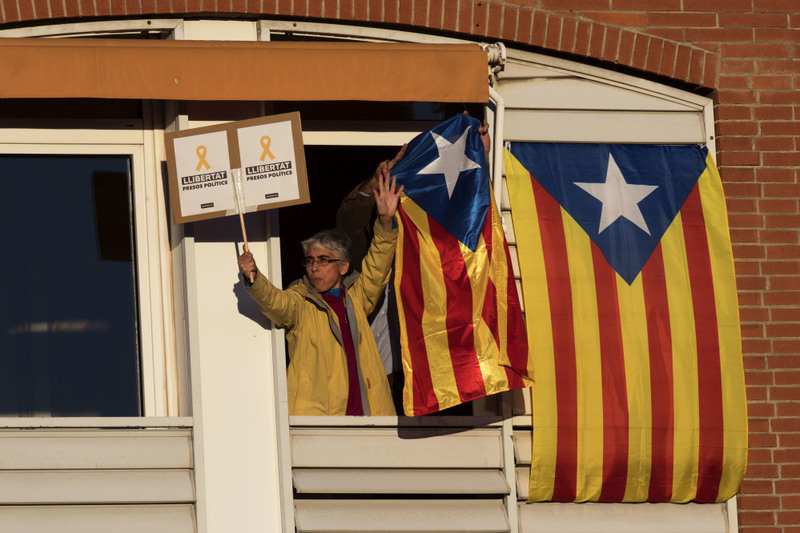 The rally’s grassroots organizers called for 10 prominent members of the secessionist movement in the northeastern Spanish region to be freed from prison. Eight former members of Catalonia’s dissolved Cabinet and two activists are in jail while Spanish authorities investigate their alleged roles in promoting an illegal declaration of independence last month in violation of Spain’s Constitution. A separate court in Madrid granted bail Thursday to another six Catalan lawmakers also being investigated over the secession push. “We want to tell the world that we want freedom for our prisoners and freedom for Catalonia,” Agusti Alcoberro, vice president of grassroots group National Catalan Assembly, told the crowd in Barcelona, the region’s capital. Barcelona’s police said 750,000 people attended the rally. Many of the protesters carried pro-independence “estelada” flags, with its white star and blue triangle superimposed over the traditional red-and-yellow Catalan colors. “They (Spanish authorities) are violating many rights of freedom against our people and we come here to say that we are against that and to demand the release of our prisoners who are in prison unjustly,” said 30-year-old engineer Joan Carles Roses. Also on Saturday, the pro-independence Republic Left party announced that its jailed leader Oriol Junqueras will be its top candidate for the upcoming regional elections on Dec. 21. The Catalan party is including other jailed leaders in its list for the regional parliament. Polls show that Republic Left is favored to win the upcoming ballot, although it won’t secure an outright majority. No foreign power has recognized Catalonia’s claim to independence. The European Union has warned that an independent Catalonia would be cast out of the 28-nation bloc.